Marc Guggenheim’s space opera continues as Manifold Tyger, a S.W.O.R.D. agent who was secretly placed at the Peak by the Providian Order, has attacked Storm and Cecilia Reyes. I do wish that the Providian Order was explained in more detail — all we gather is that they are an organization who has commissioned the twisted genetic experimentation of several species. In this issue, we see the debut of the Broodskrulls. They are under the control of a Genengineer who is not named here, but whom we know from last issue is Sharada Darthri. The art is, like in last issue, shared by Harvey Tolibao and Dexter Soy. This makes for some awkward contrasts. Both artists are extremely detailed. I particularly like how Soy draws Agent Brand as she battles Manifold Tyger. Agent Brand’s bark is usually stronger than her bite, but Soy draws her as athletically fighting. Soy is able to capture the swift motion and drama of these fight scenes. Brand’s outfit looks fantastic with various shades of green and turquoise. 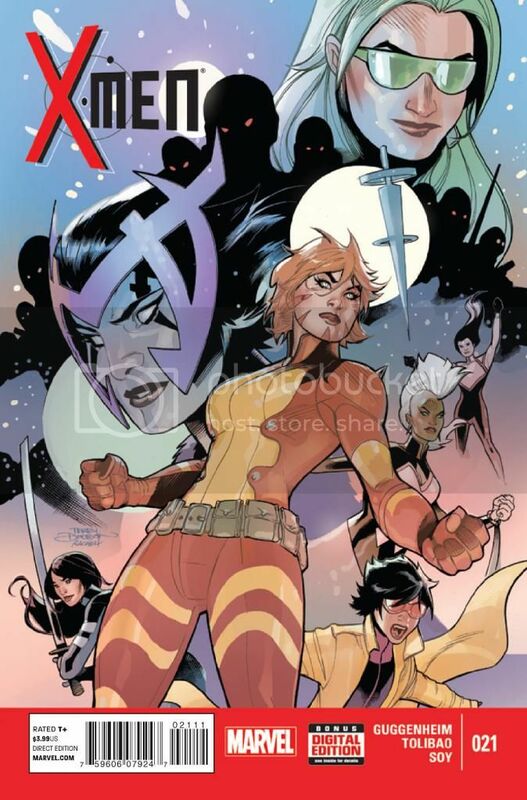 Jubilee is my favorite character of the five X-Men who have been this title’s primary cast, and I appreciate that Guggenheim lets her have more of the spotlight here. We see Jubilee use her vampire fangs to attack, something we don’t usually see, and it looks fierce and awesome. Cecilia Reyes was a surprising addition to this title’s cast — she hasn’t appeared much since Marjorie Liu’s Astonishing X-Men. Cecilia and Jubilee have some great moments of teamwork as they try to save Storm’s life. I like that Jubilee contemplates turning Storm into a vampire, saying, “I could bite her. Turn her into a vamp. Undead’s better than, y’know, dead-dead.” It’s one of the funnier moments of dialogue where Guggenheim really captures Jubilee’s character well. Not every member of the X-Men receives much time to speak in this issue. 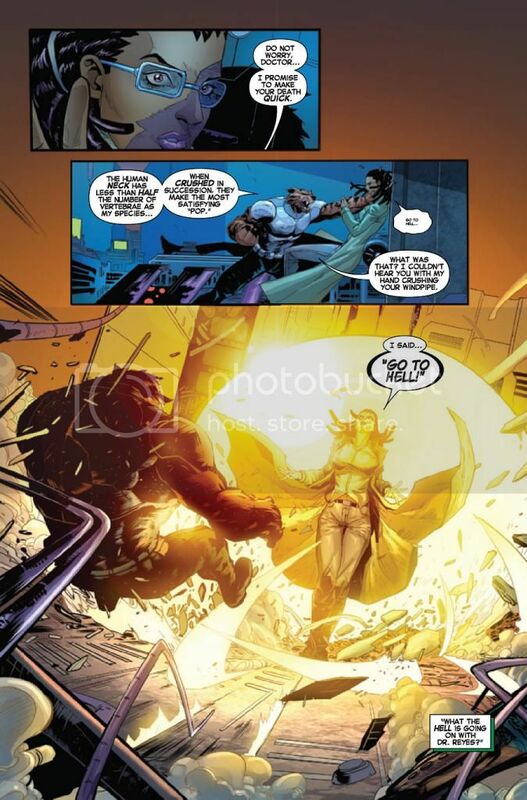 I wish Rachel and Psylocke’s brief interaction could have been extended. Monet is mostly overlooked as well. The problem with the Providian Order’s existence is that their goal is vague — just another power-seeking, diabolical group. The premise of genetic experimentation is an interesting one, but unfortunately Guggenheim does not have enough issues and pages to give it a proper backstory. It’s been teased that Vulcan has something to do with the Providian Order and this arc, but Vulcan has still not shown up yet. The highlight of the art in this issue is right on the first page: Cecilia Reyes knocking Manifold Tyger back with her force field. The burst of yellow light looks beautiful. Paul Mounts never disappoints, and his work here continues his solid run on this title. Many panels have bright blue backgrounds — I think more variety and detail could go into these backgrounds, but the artists put the emphasis on drawing the characters. As in past issues, I like how Tolibao and Mounts draw and color Rachel Grey’s hair and outfit. Rachel receives less panel time than she did in recent issues, but she still gets moments of choice words. There are moments in this issue when the art is good — really good. Dexter Soy gives Agent Brand an intimidating, powerful presence in fight scenes, and I like how he draws Jubilee. There are other moments where the art style doesn’t leave much of a positive impression. Guggenheim has the tough task of juggling a full cast of strong characters, and I like the focus he gives Jubilee and Cecilia here. However, this arc lacks the excitement, suspense, and emotional connection that the first arc with Arkea and Shogo had.